Here’s a pic. As you can see, it’s going to be a cozy room. Good news is that if when a child falls off the top bunk, the other bed will break the fall. Second, I have been thinking a lot about what the heck I can do with these kids when they get here. SAHM mom or not, you still have a lot of hours of teaching, playing and entertaining. All of my mom-friends are so talented. They are crafty, they knit, they make things on Pinterest, they make homemade paint, they can draw things like trees and dogs, they can plan birthday parties with a theme. And, all with a smile and make-up on. I can’t do any of that with no kids. I set out on Saturday morning to clean the bathroom, and as of right now (Sunday night), it’s not clean. I have friends who make 7 layer rainbow cakes (well, one friend) and plan on their meals for the week on Sundays. I can only make an elaborate dish or fancy dessert if the following conditions are present: 1) I am not hungry; 2) I have five hours of uninterrupted free time; and 3) people are coming over. Otherwise, I make grilled cheese or ice cream. I have friends who create “sensory trays” and knit. They make up games and create dioramas. I am not crafty or creative. In the first grade, Sister Donna Marie held my coloring up as an example to the class about how not to color. In the fifth grade, Sister Bernadin (these nuns were tough) gave me a D. On a drawing. Of a tree. The only creative things I do are writing witty Facebook statuses (from Saturday – “when I go out in public in sweatpants, I always wear my NU Law sweatshirt so people know that I can apply myself when necessary”) and changing the lyrics of songs to be absurd (“Our God is greater. Awesome at soccer. God you are faster and cooler and smarter”) or otherwise borderline vulgar (example omitted). Neither of those talents will be helpful in parenting. Are there classes on these things? Is there a “mothering for dummies” out there? How do you knit? What do you knit? (Why do you knit?) These kids better come with some ideas. I am so distracted. I cannot concentrate on anything except adoption. This has happened to me before, but this is definitely the worst. I can’t even put everything I am feeling and thinking into words, but I will try. The main feelings I have are (1) anxiety; (2) desire and (3) fear. I am feeling anxious because I want the time to pass so that the kids get home. I am not content in the present, and I am somewhat unrepentant about it. Don’t get me wrong. I want to be content. I pray every day that God would fill me with peace, joy and contentment in my present circumstance, but my flesh is so weak. I am regularly giving in to my flesh and living in that discontentment. I don’t know whether it’s entirely sinful or whether it’s a holy anxiety, but whatever it is, it’s here to stay. I am filled with desire to prepare, plan, list, read, study, and learn. All I want to do is prepare for these kids. This comes from the anxiety, but I also think it’s that deep down, I know that everything’s about to change in a massive way. I found a blog yesterday, and I am obsessed with reading it. The family brought home three older kids from DRC in October 2011, so I have been catching up on their story. (http://thejlees.blogspot.com) Unlike a lot of blogs, the mother documents every day of the first few weeks the kids were home. It’s so eye-opening to read her experiences. While the story is difficult (I am seeing now why this is going to be a God-effort and not a human-effort), it’s exciting to read. I am ready and want to get started! I have a lot of preparing to do in terms of learning and praying, but I am psyched. The hard kingdom work that I’ve been promised is coming! I can’t wait. It’s going to be dirty, ugly, and painful, but God IS going to change me. He IS going to provide, and I can’t wait to be a part of it. I do have a lot of fear about the big picture. I try to read a lot of info on adoption from multiple points of view, and (for those of you unfamiliar with the adoption world), there is A LOT of anti-adoption sentiment out there, much of which is totally justified. There’s a family I know who lives in Uganda who works tirelessly to resettle children with families in country and promote domestic adoption (awesome!). They are pretty strong advocates for international adoption being a last resort since most "orphans" are not really orphans at all. They usually have families, but the families are broken up or poor. I find myself constantly worrying about this. Shouldn’t we just spend our time and money helping poor mothers to keep their children? I have to keep coming back to the answer being yes. We should fight global poverty. We need to address these broken systems. Adoption is not the answer to poverty or the so-called "orphan crisis." However, I do think adoption provides a good way for people to stand in the gap. I don’t think there’s a right answer on this. We have been talking a lot about it, and we decided that we are ready for our kids to confront us on this issue as they grow up. We will ask them to forgive us for our failings and show them compassion for their loss, both the losses that we caused (by removing them from their homes) and the losses that happened before we got involved. Adoption is beautiful, but it has an ugly side. I did find this today that was very encouraging. http://wehaveroom.blogspot.com/2011/11/weimer-kids-on-adoption.html For everyone who has a bad experience with adoption, there are lots of beautiful stories. I am not wearing rose-colored glasses, but I do believe that God is at work. As you know, we are knee-deep in purging/donating/simplifying for Month 3 of 7. The goal was 7 items a day. We are on day 16, and we are up to 298 items. The new goal is 500, and this doesn’t count the items that get thrown away. These are items that we are donating to others. So far, we’ve brought a bunch of stuff to Salvation Army, but the bigger joys have come through one on one donations. We know a man from DRC who, after three years of trying, got a job! Praise God! So, we had a lot of fun setting him up with a new work wardrobe. He was so happy, and he wants us to bring some of the clothes that we gave him to his brother in DRC when we go get the kids. Isn’t that amazing? Now HE feels like he has too much and wants to bless someone else. Amazing how God works. We also know a man who sleeps under the bridge down the street from us, and we were able to give him some clothes and shoes. So far, I have pulled out 88 books from the shelves, and we gave the paperbacks to an organization that gives books to women in prison. I absolutely LOVE the thought of women in prison reading my books. So much better than leaving them on the shelves. And those books are my babies. It was not easy to part with them! So much joy over the years. I saw my tattered copy of Anna Karenina. Took me six long months to read that book. I went through the many books on the Supreme Court that I read while writing my senior research paper in law school. In the purging/cleaning category, I got rid of all my law school study aids and flashcards from the Bar Exam. Man, that was a lot of working studying! It was fun to be reminded of that time (and know that it’s over). 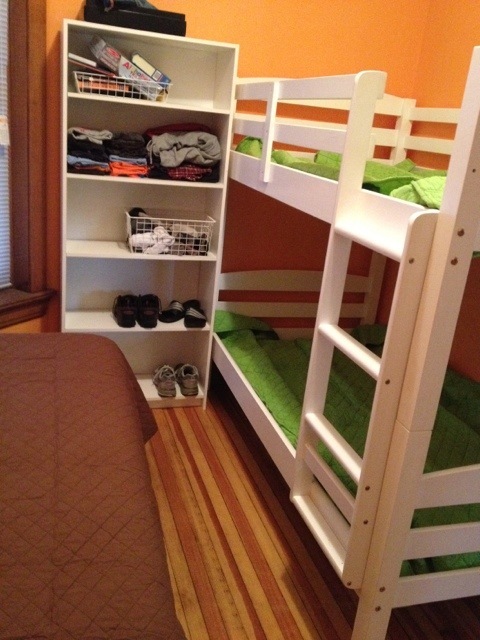 Regarding the kiddos, we installed the bunk beds on Saturday. Three kids in one room is going to be a tight fit, but it will work out. It will be cozy. We had a lot of fun walking through our apartment deciding how to make it more family friendly. We have the space; we just need to make it kid-friendly. Not much else going on there for now except anticipation. I’ve started telling people at work about the adoption, which has skyrocketed my reputation from "Amanda Who?" to total weirdo who everyone knows. I jest, sort of. Everyone’s been very excited and supportive, but it has definitely ruined my anonymity. I’m sure when people announce pregnancies, it catches people’s attention, but I don’t think it has quite the same effect as announcing the adoption of three kids from the Congo. Questions abound. I better get used to it. Anonymity is going away in all areas of life as soon as these brown kiddos move in. I can’t quite bring myself to put up their pictures because I still need to bill hours. If I have to have a 20 minute conversation with every person who walks by my office, I am going to get fired. The coming months are packed with activity so that should distract me from the endless waiting and anxiety. I have a lot of travel coming up – couples retreat to WI, trip to Cali for the Orphan Summit (so excited! ), work retreat to MI and a girls weekend in Lake Geneva between now and Memorial Day. By the time we finish all that, we may be in the home stretch!! Things keep on moving with the adoption. It’s fun to be out of the long wait period and into a shorter wait. First off, we got new pictures last week. The kids are definitely getting older! Freddy’s not such a little guys anymore; he’s definitely changing the most. Looking more and more like a little boy and less like a toddler. We got to see a nice smile from our oldest girl as well and see that she enjoys holding the babies. Carolyn looks as sweet as ever of course. We also watched an amazing video shot by a family recently returned from DRC. They documented their whole week of travel, and we learned a lot. It was encouraging to see how quickly their little girl (5 years old) bonded with them. It was also eye-opening to see what the trip was like. Best part was that we saw Carolyn for a few seconds! It’s such a difference to see live footage compared to a still photo. We finished all the rest of the visa paperwork from Carolyn and Freddy, so as soon as we get the I600 approval, we can request embassy appointments and send in the applications. Yesterday, we got the updated home study. We were advised by our agency that the court process has already started, so we will supplement with the home study. We also have to amend our I600A approval for three kids, so that request went out today. Moving right along! In other news, we found our bunk beds. They are white and wood, and the best part is that they are $125. DH found them on Craigslist, and we are picking them up on Saturday. They may even have some used mattresses we can have as well. I’m hunting now for discount bedding. We also finished a photo book for the kiddos, and a family who is traveling in May is going to take it for us. DH had a fabulous idea that we blow up the pics of the kids, cut them out and take photos of them in everyday situations. Then, he wrote a little rhyming story to go along with it. It’s adorable and hilarious. We call them “Flat Kids.” Tonight, I will write the text in Lingala, and we will send it off to our messengers. The days are evil! Around every corner I can feel it. The Devil is pushing at me so hard to veer off the path. I am constantly giving in to my own worries and selfishness. We are praying that the Lord protects us and our marriage from the evil and from our own sin. We pray that we will understand what God’s will is during this challenging time, and that we will redeem the time for good. So looking forward to the worship service tonight. As I read this week on someone’s blog, the death and resurrection of Jesus is the end of our adoption story. Probably one of the most beautiful texts in the Bible, but more than beautiful, the words are true. Isaiah wrote these words hundreds of years before Jesus’ death. I have turned astray. I turn astray every day when I criticize, judge, complain, envy. I deserve the Cross, the crushing, the piercing, the Cup, the Wrath. That was my judgment. Yet, He bore it all. The beautiful, perfect, almighty God-Man took my place. Even more than that, He comes to me, calls to me everyday. Thank you Father, Brother, King, Lord. Not just because my neighbor’s dog has literally been barking non-stop for four days, although that’s not helping. I’m starting to believe everyone else that we have "so much to do," and "need so much stuff" before these kids come. But how do you prepare for this? There’s no book. No group at church. No class. No blog. How do you prepare to fly across the world sometime in the next 6 months to bring 3 Africans home to Chicago? I feel like someone just told me to prepare for my trip to Mars. (What do you wear to Mars? How long will we be there? What’s an acceptable gift to bring to the Martians? Can I plug in my Kindle on Mars?) I know we need beds, and clothes, and toys, and art supplies, and books…and then my head explodes. Because we also need a college fund, parenting skills, rules, Congolese recipes, Lingala lessons…cue exploding head again. So, I am overwhelmed. Tonight, I need to finish our taxes (we will need those for the next set of forms) and to finish the next set of forms. All I can do is watch Glee and eat ice cream. In one sense I want to just break out the white board and start making lists. But then I think, we still have time. This isn’t really happening soon, right? But then I think, August is SOON. Oh, my brain hurts. In other news, I can wear whatever I want again. Hooray! Month 2 was a success. God revealed my vanity and excess and gave me so much grace to see how little clothes mean to life. We started month 3 yesterday – giving away 7 items a day. I am excited about this, but it’s actually contributing to my overwhelmed feeling since it means I need to clean out closets and drawers and shelves. Thus, more Glee and more ice cream. Maybe tomorrow….